On New Year's Day, we took a somewhat impromptu trip into the highlands. Our nominal destination was the possibility of seeing dolphins feeding in the Moray Firth, but the jaunt really functioned as a scouting trip for our inevitable touristing this summer, either on our own or with guests. The Moray Firth is an inlet -- the largest in Scotland with nearly 500 miles of coastline -- which expands outward as a wedge from the mouth of the River Ness. 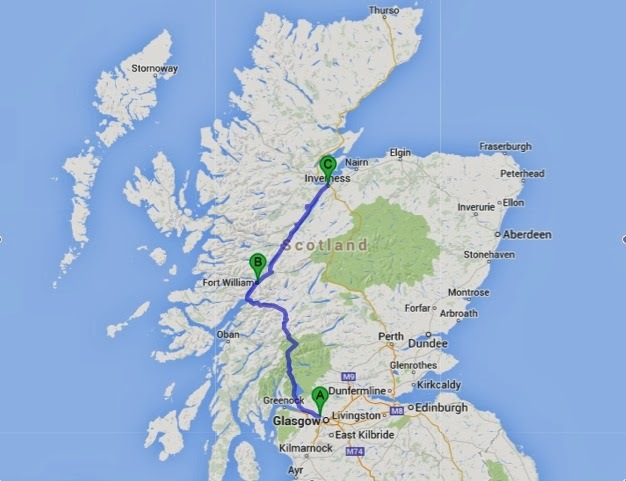 To get there, we followed exactly one road: the Great Western Road (highway A82), which begins in downtown Glasgow and ends at Inverness. It's one of the most scenic drives in Scotland, passing by the shores of Loch Lomond, through Glen Coe, within sight of the tallest mountain in Britain, Ben Nevis, and traversing the length of the Great Glen along the Caledonian Canal and Loch Ness. Allowing for a stop or two, it takes around four hours to drive this route. On our way to Inverness we made a 30-minute stop at Fort Augustus, located at the southern tip of Loch Ness. Fort Augustus has a series of five locks on the Caledonian Canal, built in the first decades of the nineteenth century by renowned civil engineer Thomas Telford. The canal was an early example of a modern public works program, designed to bring employment and shipping to a Highlands region that was quickly losing population to emigration. As with many public works projects, the Caledonian Canal took more than twice and long as expected to build and cost more than double the projected outlay. Part of the delay came from high worker absenteeism during the yearly potato harvest and peat-cutting seasons. Looking up the locks in Fort Augustus. Because of cost overruns during construction, the depth of the canal and its locks was reduced from a planned 20 feet to 15 feet. By the time the canal was completed, it wasn't deep enough for the many of the new steam-powered iron-hulled ships. A tour of the canal by Queen Victoria in 1873 helped popularize it as a tourist destination, and now more than 500,000 people visit it every year. Like us. Jackson gazes over the lock . . .
. . . to see this cascade. The view back down the staircase locks toward Loch Ness. Our trip up the coast of Loch Ness was overcast -- perfect lighting for Loch Ness Monster sighting! But alas, we saw no serpents, plesiosaurs, or other creatures. No glaring sun to blind us while searching for the Loch Ness Monster. This is the closest we got to a Nessie sighting. We also made a stop at the ruins of Urquhart Castle, situated on the shore near the midpoint of Loch Ness. Positioned to control both land and sea routes along the lake, Urquhart Castle has a particularly bloody history in a country of bloody sites, as it passed back and forth among feuding Scottish clans, as well as to and from the English at various times. In the "Great Raid" of 1545 the mighty MacDonald clan, with their allies the Camerons, plundered the castle. They took more than 2,000 cattle, several thousand other animals, and everything of value in the castle, including furniture, pans, doors, cannons, and even the metal gates. They burned what they couldn't take. By that point the medieval castle was already in disrepair. Though future inhabitants made some fixes, by the early 1700s the castle was essentially in ruins, with troops having blown up the gatehouse to prevent Jacobite rebels from using it as a base. Now, it's a major tourist stop. As the third-most visited castle in Scotland (behind Edinburgh and Stirling), the ruins of Urquhart have a garnered a new underground visitor center. If you've been reading this blog, you know that Kate, Jackson, and I have an enthusiasm for ruins; we frequently like them more than non-ruined structures. Ruins provide a wilder and more mysterious atmosphere than the oft-times inartfully "restored" or "updated" castles, cathedrals, and other buildings that are the mainstays of tourist fare. Ruins also function as great places for kiddos to roam, climb, and explore. An older motte-and-bailey (i.e., raised earth hill surmounted by a castle and surrounded by a ditch) on the right, incorporated into the newer castle (built around 1400) on the left. The view from the upper bailey. View of the exploded gatehouse. The Nether Bailey (i.e., the lower castle). Note the stairs descending to the water gate. View of the remains of the inner bailey tower. View from the tower of the Urquhart Castle interior. The castle hugs the coastline of Loch Ness. The "take away" menu of the raiding MacDonald clan. After the castle we made our way to a hotel in Inverness. Since it was dark and a holiday with lots of businesses and sights closed, we didn't explore the city other than finding a restaurant for dinner. We know we'll be back in the spring or summer when it'll be better suited for touring. The next morning we headed out to Chanonry Point, a spit of land which sticks out into the Moray Firth. It's one of the best locations in the U.K. to spot dolphins (specifically, bottlenose dolphins). The dolphins tend to feed one or two hours before high tide, usually preceded by seals. Because of the positioning of the spit within the currents, the dolphins are sometimes as close as ten or twenty yards away. Even on a cold and very windy day, a couple dozen people joined us at various times in hopes of seeing the dolphins. Unfortunately, while the dolphins are frequent visitors, we were not lucky on our visit. High tide was around 12:30 pm, and we showed up around 10:00 am to exercise the dog and explore the spit. With no sign of dolphins, we took our cue from the hard-core nature photographers and followed their departure around 12:30 pm. While it was disappointing not to see any dolphins -- though we think we saw some seal heads in the distance -- we know we'll be back again for another try. So we focused on having fun on the beach and playing with Mattie. We came prepared with lots of layers. Jackson was a trooper, only retreating to the car for a snack at the end of our vigil. At the tip of the spit of land, called Chanonry Point. Family photo in the early morning light. Looking for good rocks to take home. Jackson does not have freakishly large hands, but he likes commandeering adult gloves. A lighthouse commands the end of the spit. Operating since 1846, it's now privately owned. Those owners get a constant stream of trespassers headed toward the point. The lighthouse is now automated. Mattie was thrilled with the cold, the wind, the smells, the friendly dogs, the treats for good behavior, the muck, and the freedom to roam. After a couple of hours, we were able to tire her out. Mattie loved the strong and persistent wind. We didn't get to see dolphins, but we had a great time playing on the beach. We headed back from Chanonry Point toward Inverness, making a very brief stop at the small village of Fortrose to see the ruins of a cathedral. It's not worthy of a stop unless you're a fanatic about ruins, in which case it's still not really worthy but you're a sucker and can't help yourself. Ahem. Erected in the 1200s with red sandstone, only this small part of Fortrose Cathedral remains. We passed back through Inverness and headed east toward a Bronze Age burial site, called the Clava Cairns. We bypassed the famed Culloden Battlefield -- site of the last pitched battle on British soil in 1746, where Bonnie Prince Charlie's highland rebels were defeated by the government forces -- because daylight was growing short and we know we'll be back in a few months. Clava Cairns is a collection of three burial tombs (called "cairns") dating from 3,000 to 4,000 years ago. Around 50 such cairns can be found in the countryside surrounding Inverness, though most aren't well-preserved. All three tombs that make up the Clava Cairns are in good shape, though the two "passage cairns" (i.e., with a passage leading inside the tomb) no longer have roofs, and the human remains are long gone. These tombs deserve their own post, which I'll get to soon. A ring of standing stones (monoliths) encircle each of the cairns. You can get a sense of the lower height of the passage and the taller height of the chamber. One of the standing stones cracked and the top half fell right next to the bottom half. All of the cairns were built to align with the setting sun of the winter solstice, taller in the northeast and lower in the southwest; the sunlight traveled into the chamber through the passage. Within view of these Bronze Age piled stone cairns is a late 19th century structure of piled stones. Built in 1898, the Clava Viaduct was built for the Highland Main Line railway. It is the longest masonry viaduct in Scotland. The viaduct has 29 arches. Not all visible here, if you're counting. Our scouting trip ended with a drive south through the Cairngorm moutains, past Aviemore, and returning to Glasgow in the early evening, a drive of only about three hours, in contrast with the four-hour route we took north. The outdoor splendor of the Cairngorms will await a future visit. Though short, our trip gave us an idea of what we'll want to do when we return. I just wish I had some dolphin photos. Next time!